Research group led Professor PAN Jianwei and Professor LU Chaoyang from the University of Science and Technology of China (USTC) of Chinese Academy of Sciences (CAS) with Professor YOU Lixing's group of Shanghai Institute of Microsystem and Information Technology (SIMIT) of CAS carried out an experiment on boson sampling with photon loss, which brings a demonstration of quantum supremacy closer to reality. This research was published in Physical Review Letters on June 6th as one of Editor's Suggestions. 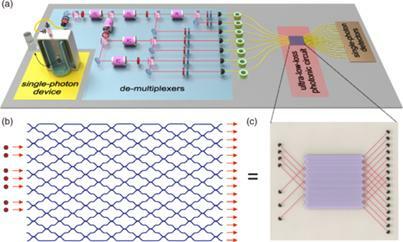 Boson sampling with photons is considered as a strong candidate to demonstrate quantum computational supremacy. However, the unavoidable photon loss in the photonic experiments is a major obstacle to scaling up. Based on a world-class single-photon source from a quantum-dot micropillar developed by PAN's group and high-performance superconducting nanowire single-photon detectors (SNSPD) developed by SIMIT, PAN and colleagues' work was the first to confirm experimentally that even as photons leak from the system, boson sampling with photons still produces useful output. This discovery means that researchers don't have to "toss away" the output of a sampling experiment when photons are lost, allowing for exponentially faster sampling rate. This research helps scientists take another step forward for the demonstration of quantum supremacy. This work is supported by the National Natural Science Foundation of China, the Chinese Academy of Science, the Science and Technology Commission of Shanghai Municipality, the National Fundamental Research Program, the State of Bavaria, and the U.S. National Science Foundation.